The Omega J8003 does all this and even helps grind coffee. Can 80RPM really make juicing more nutritious and healthy? Seems so because the Omega J8003 masticating juicer manages to produce more juice, less froth, drier pulp and a higher nutritional profile. Compared to high speeds of 1500 to 15,000 RPM, seems just 80 RPM manages to keep the vitamins and enzymes found in fruits and vegetables intact without heating or destroying them. The end result of this process is 72 hours storage time. 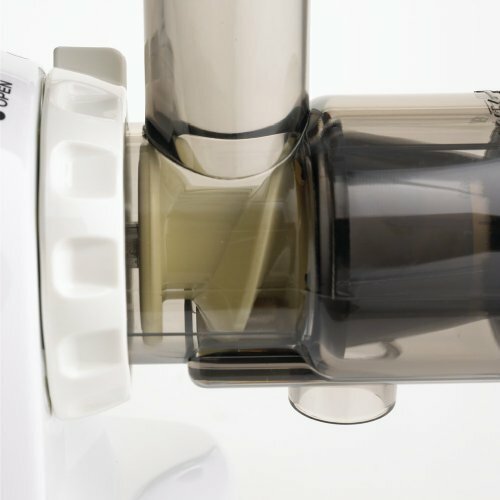 This particular juicer depends on a dual stage filtration action that helps process fruits and veggies until they have nothing more to give. The Omega J8003 makes a lot more than just juice. It’s also adept at preparing fresh pasta strings, mincing herbs, grinding coffee and emulsifying baby food. It uses sieves and stainless steel mesh filters inside to help siphon off pulp and remove froth. Plus, six different nozzles for this juicer help it perform variety of other tasks as mentioned before. Omega J series masticating juicers are all designed the same with minor changes in construction, material used and operations. The Omega J8003 upon inspection revealed a slightly lower grade construction with a plastic outer body whereas its higher J8005 and J8006 seem to have stronger augers and a stronger base. Nevertheless, in tests, it performs at par with the higher models. Just as before with other Omega models, I tried out a mixture of cabbage, carrots, apples and kale together to give it a fair test. It took about 5 minutes to make 2 cups of juice and the total ingredients used was almost nothing. Had it been a centrifugal juicer, it would have made just half a cup of juice instead. 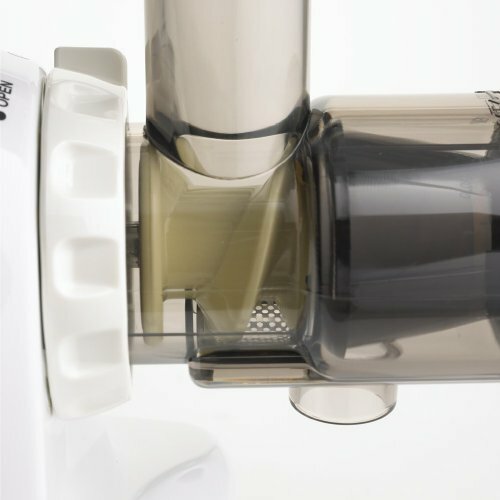 Coming to the cleaning up part, it does pose a problem since you have to open the juicer up, clean the auger, clean the filters, remove any remnants of fruit pulp stuck near the pulp collector outlet and then put the entire thing back together. But, considering the efficiency and output, this is a minor price to pay. The only real concern for me though with the Omega J8003 was its tiny feed chute. I had to chop up most of the veggies and fruits just so that it would fit into the juicer. Otherwise, it performs as expected from an Omega juicer – simply splendid. Construction might appear to be low grade but its heavy and made to last long. Plus, the 10 year long warranty does provide some relief. Once again it is the small feed chute that plagues Omega juicers. The J8003 probably has the smallest of all Omega’s feed chutes. Not that it makes a huge difference but yes it does add to the total time required to juice. Cleanup requires a complete dismantling of the body and individual pieces, thankfully doing this is super easy. Just remember to remove every last pulp remnant from the system before you put it all back together. Never doubt the quality of juice produced by an Omega, this is what we ultimately learnt. 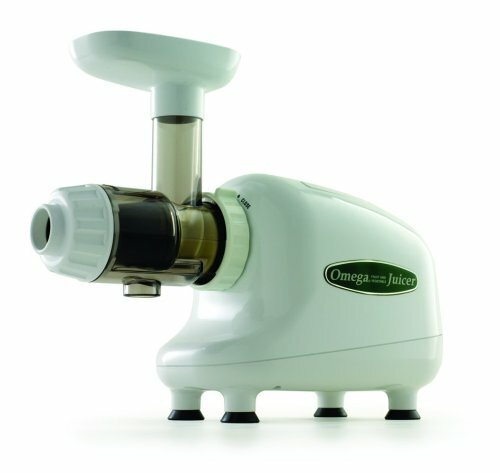 The J8003 being the cheapest of Omega’s line of masticating juicers doesn’t drop its quality metrics by even a decimal. The verdict here, go for Omega if quality really means a lot to you. 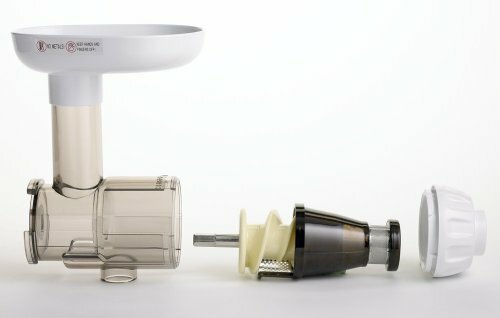 Once again, Omega juicers have proven that quality and quantity can co-exist. The J8003 produces a lot more juice than any high-end centrifugal juicer can ever manage. Underpowered compared to other Omegas but it is more than sufficient to juice high quality. However, in an attempt to keep the power levels at a high, Omega has had to substitute some of the parts of the J8003 with plastic or low grade materials. It is our belief that the use of low quality components, a less sturdy auger and so on has led to a massive increase in the noise of the J8003. Nevertheless, for budget conscious folks, noise ought to be the last thing they are looking at. Considered as the best class of juicers, masticating types produce more juice, conserve more energy and eat less raw materials. The Omega J8003 does all this and even helps grind coffee, make pasta and mince herbs. Basically, it’s a juicer and food processor rolled into one. If you are into healthy juicing and want a little extra on the side, the Omega J8003 is just perfect for you. Overall, we had a great time testing out this commercial juicer. It’s something we recommended to anyone looking for an efficient juicer with lots of power. Even thought this is a commercial masticating juicer, it would able to handle just everything we threw at it. Customers on Amazon.com rate it almost 5 stars with over 200 votes for a reason. It’s a good buy! Pros: Excellent yield and quality of juice produced, dependable and Omega level overall quality – this is the best affordable masticating juicer in the market today. Cons: A tad bit noisy and yes, construction isn’t the best but in all honesty it is cheap. Also, beware it has a small feed chute. 1/3HP induction single phase commercial grade motor. Low 80 RPM speed to prevent heating, frothing and clogging. Dual stage juicing mechanism increases yield and ejects dry pulp automatically. Can function as a grinder, homogenizes, pasta maker, food processor and obviously as a juicer. Covered by a long 10 year warranty.